The Deans came about in a ambiguous way somewhat. Way back in the beginnings of Shama, Michael Sicoly often made the point of saying he wished our name had a ‘The’ in front of it. For a time, we had thought about using ‘The Pages’ (which looking back would have been a pretty good name), but we went with Shama and the ‘The’ issue was forgotten about. Zipping ahead many years later, there was talk of three of the Shama guys doing a throw together gig with our old friend Mike Evans. 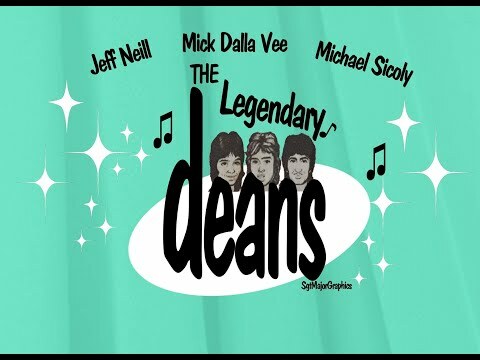 When coming up with a name to call this ‘throw together band’, Mike Evans suggested ‘The Deans’ which would double as an acronym for ‘Dalla-Vee, Evans, Armstrong, Neill (and if Mike were to sign on, Sicoly as well). When I mentioned this to Mike, he was already booked but loved the name ‘The Deans’. A few years went by again, and in 2011 Michael Sicoly wanted to get together with Jeff and I to sing together like the old days just to see what would happen. We hadn’t done anything with all three of us in the same room since 1980 when Shama broke up. After warming up with ‘Boogie Woogie Bugle Boy of Company B’ (which was an old show stopper that Shama used to do in the late 70’s) it seemed like the magic was still there, so we got together once a week to sing songs and to mainly just laugh our heads off at all the old stories we shared. A friend of ours Lynne Davis (who was a cancer survivor) had mentioned to Michael that http://abreastinaboat.com (The World’s First Breast Cancer Dragon Boat Team) was doing a fundraiser at The Bell Centre Theatre in Surrey. Michael thought it would be a great opportunity for the three of us to perform live again after all these years. He threw the idea at Jeff and I and we agreed, so Mike put it together with Lynne. When coming up with a name, The Deans was once again brought up. It was a throw back to Michael wanting a ‘The’ in front of a name and we all felt that our musical maturity and steadfastness all individually in this crazy industry somewhat deserved the name ‘Deans’. I’ve taken a few good-natured ribbings from Mike Evans in us using ‘his name’ but Mike’s one of the nicest people in the world and would only truly wish anyone the best. At The Bell Centre there were cameras rolling for the show. A few days after our performance. I had heard that sadly the ‘audio mix’ from the front of house mixer was unusable due to distortion. To me the video with no audio was useless so I I never thought about the footage again at all until Michael phoned me in May of 2015 to tell me that Lynne had the footage still and asked if would I like to see it. I called up Lynne and she brought it all over to my place. I found that yes, the feed from the board was terrible, however, the performance was good enough that the camera microphones themselves picked up the performance fairly decently. I took all the microphone audio tracks and put them into ProTools to try and decipher what was the best mix of all of the audio tracks to best represent the performance. After that, I put all the footage available into my video editor and threw the videos together…. mostly for posterity’s sake.